In our last Satch & Fable review, we were introduced to the 13’’ Leather Satchel. Made of goat leather from India, it exemplified the Buddhist concept of Wabi-sabi which finds imperfection and transience as beautiful. This time around, owner Fabrizio Giuliani has introduced a whole new line of travel and backpacking gear with the same concept and beautiful leather. If a satchel isn’t your thing, then take a look at the Satch & Fable Laptop Backpack. Like the leather satchel, the leather of the backpack is full-grain goat leather. This means the backpack is exceptionally light while retaining its water-resistant properties. As previously described, the Indian goat leather is tanned using traditional Moroccan techniques giving the leather the misnomer of “Moroccan leather.” Because Moroccan tanning is a manual labor-intensive and odorous process, the leather often has a distinctive smell. The satchel I received did have a mild unique leather smell that I noticed right away. It wasn’t unpleasant, but it was distinctive and different from the chemically created leather smell that most western leathers have. This backpack, however, is much less “smelly.” Inside, there is waterproof canvas lining. Outside, brass hardware is sourced from India, and the external pocket has an interesting Oklahoma state button. Each bag is made by hand using vintage sewing machines with cotton stitches. Because goats are smaller creatures, multiple panels are sewn together to create this larger bag. Don’t expect this bag to be able to handle a hike up the Himalayans or outlive your children. 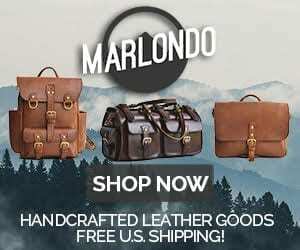 For a bag constructed for enjoyment in the short-term, it still has all the bells and whistles of the many durable rugged leather backpacks out there. The backpack measures 16x10x4. The key number here is “4.” This backpack is designed with a laptop in mind. Therefore, it is thin but still surprisingly roomy given the ample length and height of the bag. It easily fits my 13’’ MacBook Pro and iPad Air, but should be able to fit a 15’’ laptop and more. The middle compartment is padded on the bottom and sides to offer a nice pleasant cushion for your prized electronics without the hassle of an additional laptop sleeve. On the outside, there are three external bucked pockets and there are two zipper pockets on the inside. Inside, there are also pen holders and a cell-phone pocket made of leather sewn against the canvas lining. The only downside to all these multiple storage areas is that each of the 3 compartment/pockets drop all the way down to the bottom of the backpack. Therefore, things like laptops, folders, papers, magazines are great and easy to place into the backpack. One the other hand, smaller items I take to work such as my snack bag of almonds, notepad, measuring tape, vitamin bottle, and iPod all fall to the very bottom which requires a bit of rummaging and emptying everything out to find what you to want. The backpack also comes with detachable carrying straps. Placed slightly narrow on the backpack, they may fit a bit snug on people with wider backs or waists but the straps are soft and thin and the backpack can be carried off a single shoulder. Well if you’ve never had a tanned goatskin bag, then you should get one. The leather comes weathered, soft, and completely unique. 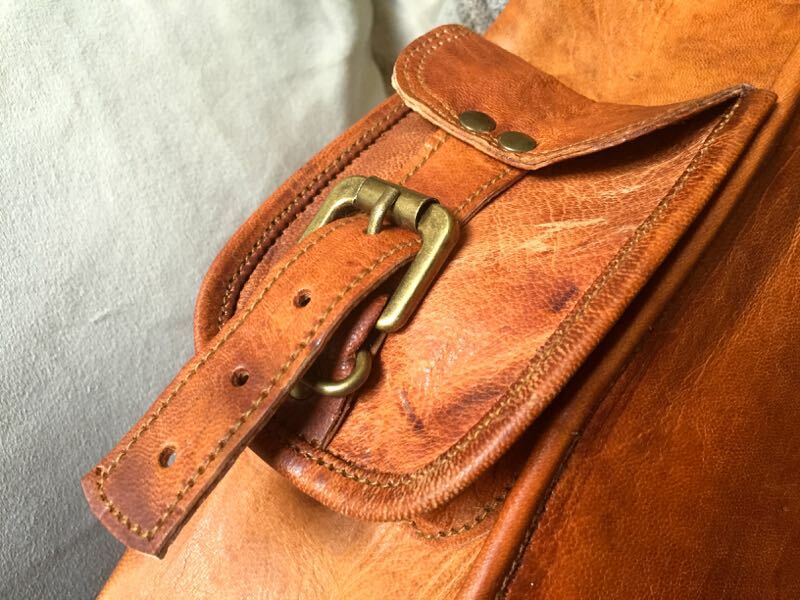 No two bags will ever be alike and every single blemish, mark, and scar only adds to the character and attractiveness of the leather. Inside, the dark blue canvas lining adds a flash of color and modern flair to a bag that looks like it’s been in the family for decades. In two weeks of carrying the backpack around work, no less than three random strangers have stopped to compliment me. I guess the bag speaks for itself. The Satch & Fable Laptop Backpack at $269 is a beautiful, attention-grabbing backpack. It is ideal for those looking for an affordable, lightweight, back and shoudler-friendly bag for carrying their laptop and other items – something you can just grab and hang over your shoulder the entire day without sacrificing comfort. 2 Comments on "Satch & Fable Laptop Backpack Review – $269"